Max’s Restaurant on Ring Road was the place to be last night as VIP guests, including stalwarts of the local Pinoy community, attended the launch of the popular Filipino restaurant’s new menu. Conceptualized by Chef Enrique Suarez, or Chef Henry as he is popularly known, the new menu features for the first time, grilled dishes, sizzlers, seafood and Pinoy favorites like Adobo, Sisig, Tokwa’t Baka, Inihaw na Pusit and Boneless chicken BBQ and even Spanish influenced dishes like the Beef Ribs Humba. It will also continue to include core dishes such as Max’s Fried Chicken and Kare-Kare that have helped cement Max’s reputation as the region’s number choice for Filipino food. Renowned for its signature dishes, which combine sweet and savory flavors, legendary ‘Sarap to the Bones’ Max’s Fried Chicken, cosy interiors and heart-warming service, Max’s is a must-visit for the discerning food lover. “We are already hugely popular with the local Filipino community being their first choice to celebrate a special occasion, enjoy a nice meal or a casual catch up with friends. This is because Max’s promises an unforgettable dining experience, one that takes the Pinoy back home and everyone else to a dining table in the Philippines,” added Peter Tong, Country Manager, Doha, Foodmark LLC. “This new menu celebrates the diversity in Filipino cuisine that is bright and rich, delicious and versatile. 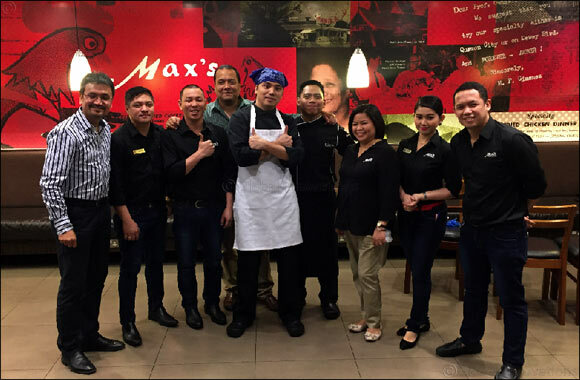 Chef Henry has taken traditional favorites and regional eats and added his own special touch to make Max’s new menu something that we are certain everyone, Filipinos or otherwise, will relish,” he added.